Is your toddler ready for a deep sea adventure? Perfect. 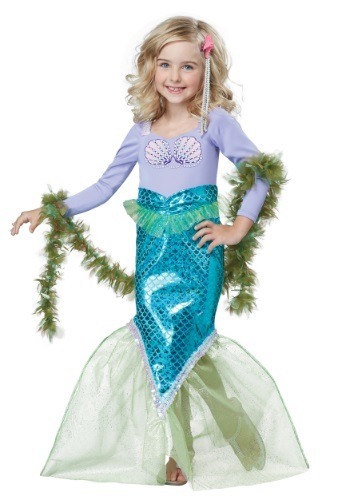 Let's get her suited up for a fantastic time with this magical mermaid costume! She might be a little too small to swim with a flipper and she probably doesn't yet have the vocabulary to play tricks on salty sailors. But that doesn't mean she can't be the most adorable mermaid swimming all around the sea! This costume is styled as a dress, which of course means that your little one will still be able to use her legs since the flipper is just organza mesh! A polyester shirt top has printed shells on the chest and has attached trim on the inner shoulder. The attached skirt has shimmering printed fish scales, and an organza tulle accent around the waist. The included "seaweed" boa completes your little one's transformation to turn your little one into an undersea dweller! Use this gorgeously detailed costume to complete your family's group theme, or to make her your little mermaid princess in training. With the elegant organza shimmering and shining, she'll be ready to fill the shoes of a legendary ocean dweller when she goes in this luxe costume. We're sure she'll have a great time using her imagination as she pretends to be a part of an under-the-sea adventure!